Ultima VII Part Two: Serpent Isle is the eighth installment of the main series and the twelfth in the entire series, if Worlds of Ultimas and Ultima Underworld I and Ultima Underworld II are counted. It was released and published by Origin for the IBM-PC in 1993. It is part of the "Age of Armageddon" saga. 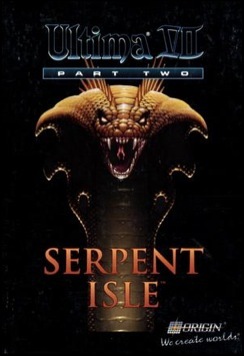 Serpent Isle uses the same engine as Ultima VII, only more refined and with additions, therefore there isn't much difference in the technical aspects of the two games. The story and world however, are quite different. Compared to its predecessor, Serpent Isle is much more linear and is built around scripted scenes - the player can't explore the whole world right from the beginning. The story reflects this as well and is very different, being set away from Britannia for the fist time since Ultima III. Serpent Isle is different, but that doesn't mean that it is bad. The story is very complex and has many layers, forming a huge epic of love, hate, war, peace, balance and imbalance. Sadly, the game had some cuts in the story because of a deadline issued by Electronic Arts. Serpent Isle sold quite well, and received much praise from both critics and the players. 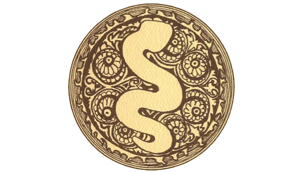 ▪	Cloth map of Serpent Isle. The add-on disk, published by Origin in 1993. With it installed, a totally new quest becomes available, which can be played at any time in the game. The add-on is included with most new releases of U7pt2:SS. The Xenkan Monks find a mysterious Amulet, the Amulet of Balance, which they give the Avatar. 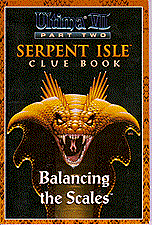 Using it on a Serpent Gate, he/she and the companions travel to the past, into the time of the War of Imbalance. 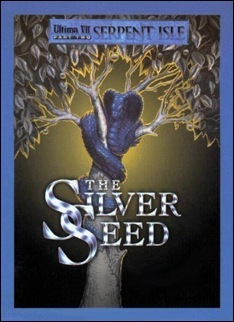 The Avatar has to find and plant the Silver Seed, to prevent the imbalance from destroying the world. Finding many fine artifacts on the way, like the Ring of Reagents and the Loriel's Gift, the Avatar succeeds in this task, thus saving the world from ultimate destruction. Included with it is the "Silver Seed Play Guide" pamphlet. ▪	Richard Garriott had decided that no two Ultimas should use the same engine. 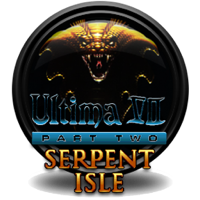 Since Serpent Isle did this, it was named "Ultima VII Part Two". ▪	Originally, Both Ultima VII and VII/2 should have been one huge game, but time problems and the practical problems in the time of floppy disks prevented this plan, and the game had to be split in two parts. Remnant of this is still in the U7:BG. Gwenno tells in her letter that Lord British has the map to Serpent Isle and Avatar would receive it at the end of Black Gate. ▪	The deadline set by Electronic Arts resulted in a number of unfinished things, and plot cuts. Most well known is that Cantra can't be cured of her madness (the text can't be activated but is in the usecode). ▪	Probably the last "classical" Ultima. The musical score was originally arranged and composed byDana Glover, Marc Schaefgen, Raymond Benson, Kathleen Jones, Herman Miller, David Watson, Kirk Winterrowd for the IBM PC version. These tracks were played on a Roland MT32 and recored in digital format. Click on the lute to download the music files.